To be a highly profitable matched bettor you want to be gaining as much expected value from your bets as possible. Expected Value is a concept used to describe the average outcome of a given scenario when the scenario hinges on an uncertain, probabilistic event. With betting, Expected Value is the amount you can expect to win or lose if the bet you placed was able to be repeated many times over. Expected value is calculated through a simple equation. Multiplying your probability of winning with the amount you could win per bet, and subtracting the probability of losing multiplied by the amount lost per bet. 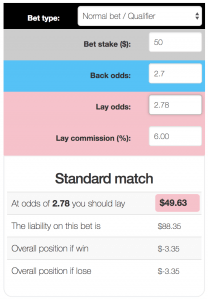 Expected Value is often abbreviated in the matched betting community to ‘EV’. Understanding Expected Value is important for someone matched betting because with hundreds of bookmaker promotions available each week you may not have the time or the funds to place every +EV bet potentially available to you. Understanding the EV of a promotion will allow you to make more money in a shorter amount of time by helping you to make decisions of where to best spend your time and money. It will also help you to avoid making bets that have -EV which would cost you money in the long term. The most common way someone starts matched betting is to complete all of the sign-up bonuses offered by bookmakers. With these bonuses, someone matched betting can typically guarantee a 70%+ return of the sign-up bonus offered. So the EV of a $1000 sign-up bonus is $700+. If you are just beginning matched betting It is more important at this stage to understand the technique to guarantee a 70%+ profit rather than concern yourself with EV. Our interactive guide to matched betting explains how to complete this process. It’s very simple to work out the EV of both 'Place bet get a free bet' and 'enhanced odds offer'. You can use the same method as you would when back/laying a signup promotion. Just enter the bookmaker back odds and the Betfair lay odds into the matched betting calculator to calculate your profit. Our guide to 'Place bet get a free bet promotions' walks you through an example and shows the potential profit made. By far the most common ongoing promotions offered by bookmakers are ‘If Bet’ offers. These are promotions whereby you gain cash back, bonus bets, early payouts or enhanced profits if a certain scenario occurs. 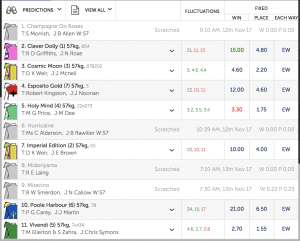 Crownbet - Place a Fixed-Odds Win bet and if your horse finishes 2nd or 3rd, you'll get your stake back in matched Bonus Bets up to $50. TAB - Place a Head to Head bet on any NBA game with your TAB Account and, if your team leads at halftime but loses, get a Bonus Bet up to $50. Ladbrokes - If your head to head be leads by 10 or more points at any time of the match, you'll be paid out as a winner. TabTouch - Place a Match Result bet on the World Cup Playoff between Honduras and Australia, and if your selection is correct at the 85th minute but then doesn’t win, money back up to $50. To calculate the EV of any 'If bet' promotion all we need to know is the qualifying cost amount, the amount you profit if the promotion triggers and the probability of this occurring. Qualifying cost - The amount it costs to back and lay the bet to qualify for the promotion. This can be easily calculated by entering the back and lay odds as well as the amount of bet into our matched betting calculator. Profit if promotion triggers - The amount of profit you would make if the promotion triggers. This must take into account how much money would be returned from any free bet as well as the cost it took to qualify for the promotion. Probability of triggering - The probability of the promotion triggering. This can be calculated by looking at historical data and calculating a probability or from using Betfair markets to get an understanding of the true odds of the promotion triggering. Crownbet offer a bonus bet if your horse comes 2nd/3rd up to $50. To calculate EV all we need to know is the qualifying cost amount, the amount you profit if the promotion triggers and the probability of this occurring. This means we can work out the qualifying cost by using the back/lay calculator. To calculate the probability of the horse coming 2nd or 3rd we need to know the probability of the horse coming first, and the probability of the horse to place. We can then subtract the probability of it coming first from the probability of it placing to give us the probability of if coming second or third. To find the probability of something occurring from decimal odds simply calculate (1/decimal odds). We now know the qualifying cost, the probability of the promotion triggering and therefore it is simple to calculate that the probability of the promotion not triggering is 60%. Before we can calculate EV we also need to know the profit made if the promotion does trigger. Let's assume you can follow our guide to converting bonus bets and are able to retain 80% of your bonus value. Then a $50 bonus is worth $40. But we would still lose our qualifying cost so in fact, our profit would be $40 - $3.35 = $36.65. Now we can calculate EV for this promotion. So in this promotion with this selection and odds the EV = $12.65. So if you were to play this offer out thousands of times it would average out to $12.65 profit each time you placed the bet. You can see the above example in our 2nd/3rd Overs Calculator here. Just because a bookmaker is offering a special or a promotion it doesn’t necessarily mean that the offer has +EV. Many odds boosts or enhanced odds won’t match the odds that you could get simply by backing on Betfair (inclusive of the commission charged at Betfair). Also many ‘if bet bonuses’ have such a small likelihood of occurring that when you factor this into the EV equation you will come out with a negative number. So if you were to play these type of promotions a large number of times you would come out losing money. The Bonus Money EV Simulator gives us the ability to see a sample of what would happen in various situations, obeying the Law of Large Numbers. You will see that the more trials simulated, the closer the EV correlates to Net Position. Have a look at the EV Simulator page, scroll down and you can see some examples of scenarios. Expected Value is an important concept to understand in making your matched betting more profitable. It is possible to visit each of the bookmakers websites and finding out what promotions they have on offer and calculating if the promotion has positive expected value. All positive EV promotions are then displayed in our offer calendar and discussed in our Facebook community. Understanding which promotions have the most EV will enable you to make more profit with the bankroll you have. The Bonus Money Pro service aims to list every possible +EV promotion available to you. We also make suggestions on how to best play each promotion in our secret community. You can expect to make in excess of $2000 per month by completing every ongoing promotion available to you.